Trego is Premium Responsive Zencart template. It’s extremely customizable, easy to use and fully responsive. Suitable for every type of store. Great as a starting point for your custom projects. This Trego theme includes several Zencart modules including Slideshow and Menu that will help you improve your sales. On the main page you can quickly show your best products and brands. Trego is extremely beautiful on mobile devices. We provide only premium eCommerce products, guaranteed regular updates and top speed. You can choose the background color for your logo and the right color for the text and buttons. There is an unlimited number of colors for each of these elements. 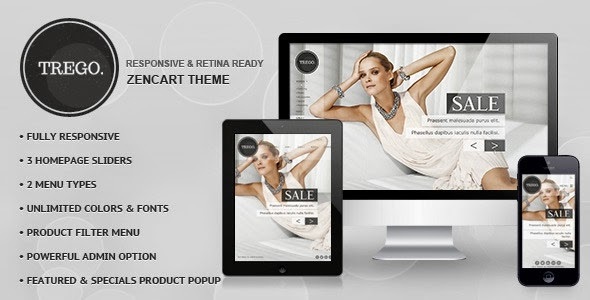 Item Reviewed: Trego - Premium Responsive Zencart Theme 9 out of 10 based on 10 ratings. 9 user reviews.